I knew today was going to be rainy, so I decided it would be a good day for an indoor activity. I've been meaning to get to the Burke Museum with the boys since school got out. I figured we'd get up and get on the bus early and be there just after opening, around 10:30. That was before I slept in until 8:30. Cloudy skies make a big difference in waking times for everyone in our house, apparently. Then I realized we were almost out of milk and since Ryan was going to work from home we needed to have milk on hand. By the time we got all of us up and dressed and fed and got to the store, it was 11. 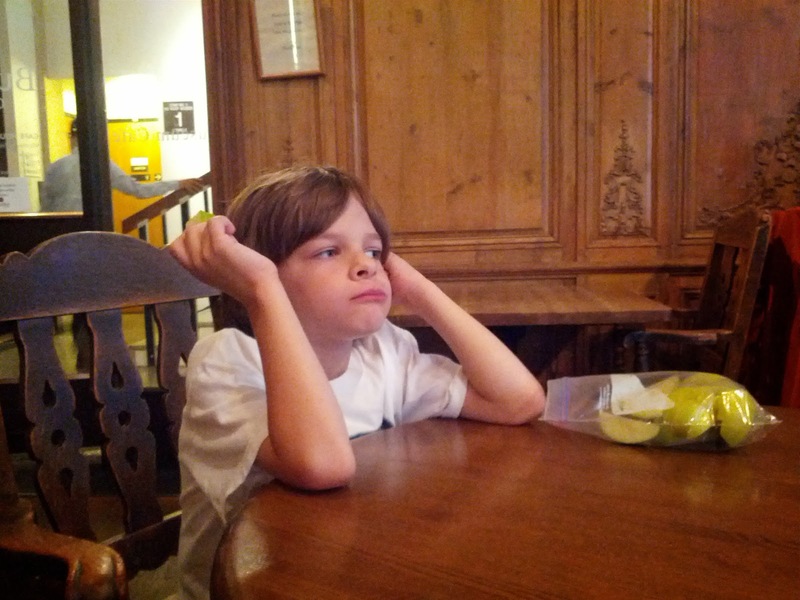 Which made me nervous to go because, even if we drove to the museum, we'd be running into lunch time and nap time. But I feel badly that we haven't gotten out much this summer, so I forced myself to go. It turned out better than I expected. Parking was easy (though you do have to pay - taking the bus is much cheaper and just as easy). I wasn't sure how well Malcolm would do, but he loved it. 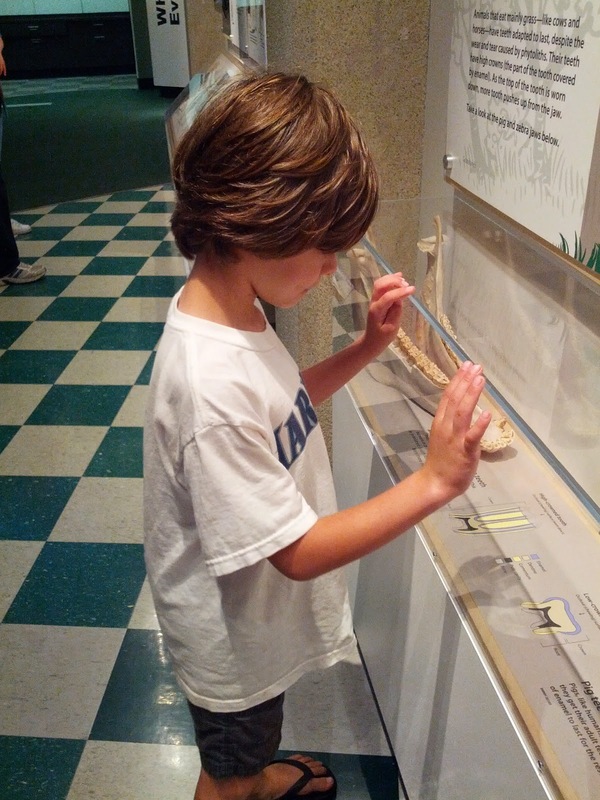 I wish I could've captured his smile as he looked at the various masks and crystals and fossils. He didn't look at any one thing for long, but he did want to look at everything. 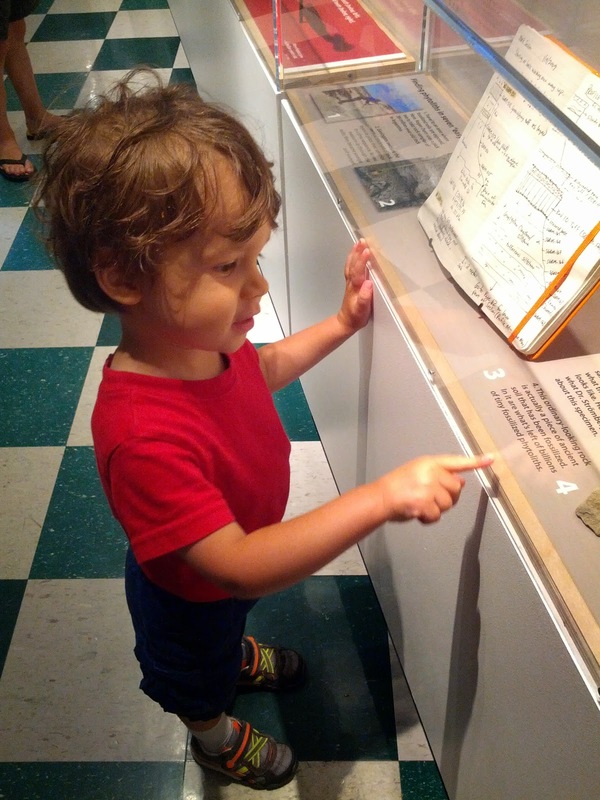 Gareth actually took some time to read what was on some of the displays this time around. He may have done more of that, but Malcolm kept us moving rather quickly. Here he's reading about the difference between high-crown and low-crown teeth. Malcolm thought this mastodon was very cool. He wanted me to pick him up to see it better and kept repeating, "So big!". He seemed a little more nervous about the dinosaur room, for some reason. There was someone rolling a cart somewhere and it was sounding quite loud and echoey in the dinosaur room, so I don't know if that made him nervous, or if he was actually nervous about the big dinosaurs. In any case, it meant we didn't hang out with the dinosaurs for very long. Next we headed downstairs to see the Pacific cultures exhibit. Malcolm was starting to get a bit unruly by this point, so we really didn't do any of these displays justice. 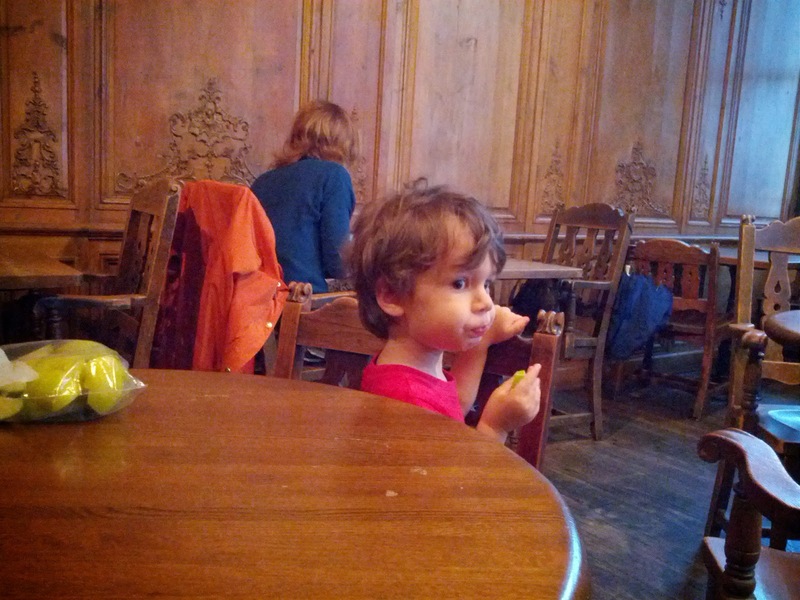 After several minutes trying to keep Malcolm from touching totem poles, we ducked into the cafe attached to the museum for a snack of apples and fig bars. It was just the break Malcolm needed (and I think Gareth appreciated it as well). 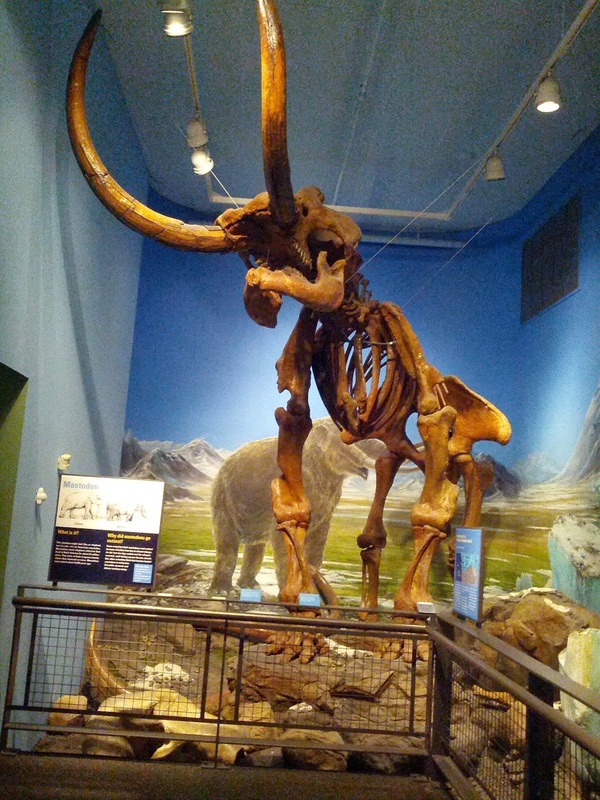 Gareth really wanted to see the mammoth tusk, so we headed back upstairs to the last exhibit to find that. It's still in plaster and will be for quite some time. They've got a bunch of other items from their collection out right now as well. Specimens that were collected to determine how things were reviving after Mt. 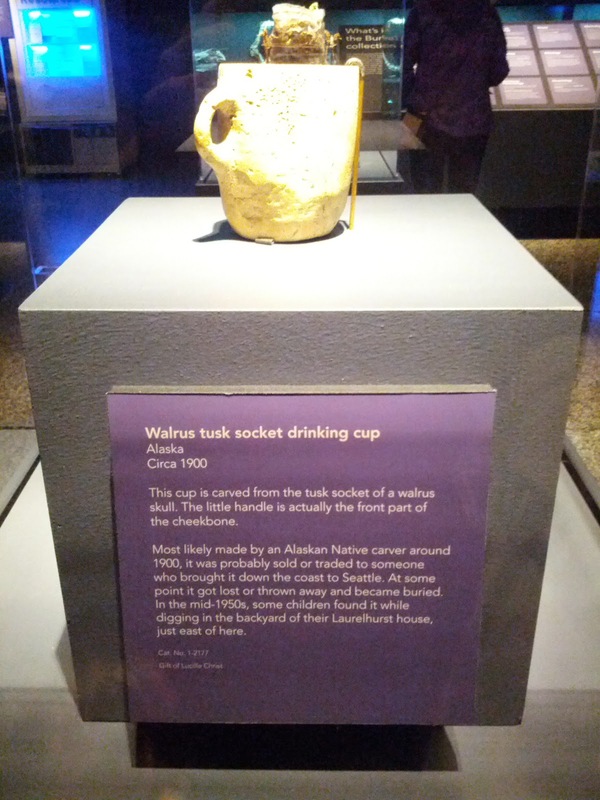 St. Helens erupted in the 80s, a walrus tusk drinking cup, turtles, snake skins, etc. 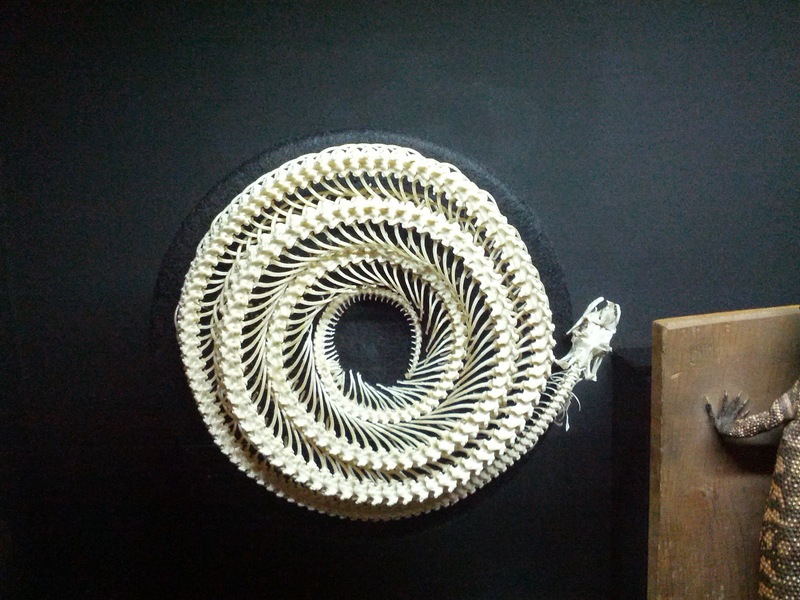 I thought the coiled snake skeleton was cool. They also had a college student there working on separating krill from fish and other creatures. We talked to her for a bit about what she is doing. Basically, sounds like a bunch of plankton containing water is collected up in Alaska and then they sort out what is in it. It looks like the krill are the most common, but they've got a few types of fish and some squid as well. Doing this allows them to determine what species are breeding and how successfully. Some of those species eventually come down this way, so it's important for people in this area to know that information as well. Gareth listened attentively and asked about how she tells the difference between the krill and the fish. I was surprised Malcolm stayed interested (okay, interested here just means he wasn't wriggling out of my arms and running around - he was actually looking at her jars and equipment and "listening" - I'd say that counts as interested for a 2 year old), but he did and even gave an approving "Fish!" exclamation after Gareth and I finished talking with her. A fun place to go for an hour or two. It was busy today, but not overly crowded. Gareth wanted to stick around longer, so I promised him another visit later in the summer.